New Orleans paper is shedding 21% of its editorial workforce. When The Picayune newspaper was launched in 1837 by Francis Lumsden and George Wilkins Kendall, the purchase price was a single picayune, a Spanish coin equivalent to six and a quarter U.S. cents. Two centuries later, the principal problem enshrouding the American daily newspaper business is that a click from a reader via the Web, smartphone or tablet amounts to pennies on that Picayune coin. NOLA Media Group announced today that it is restructuring its news operation to reinforce its core journalistic mission. In plainer, second-paragraph English: 28 full-time and nine part-time nola.com staffers are being let go (21 percent of the editorial workforce). 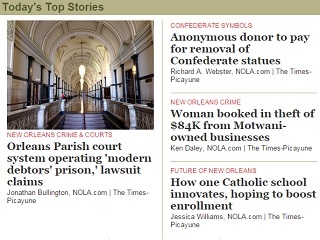 Over the past few years, the New Orleans paper has been forced to endure a seemingly endless series of upheavals on the newsroom and print schedule fronts. pdxperson1: Always disgusting to see a newspaper publish something about itself using corporate nonspeak and jargon you would never tolerate from other companies. “operational efficiencies?” “core journalism nonspeak?” This is the exact kind of business spin that should never be in journalism.